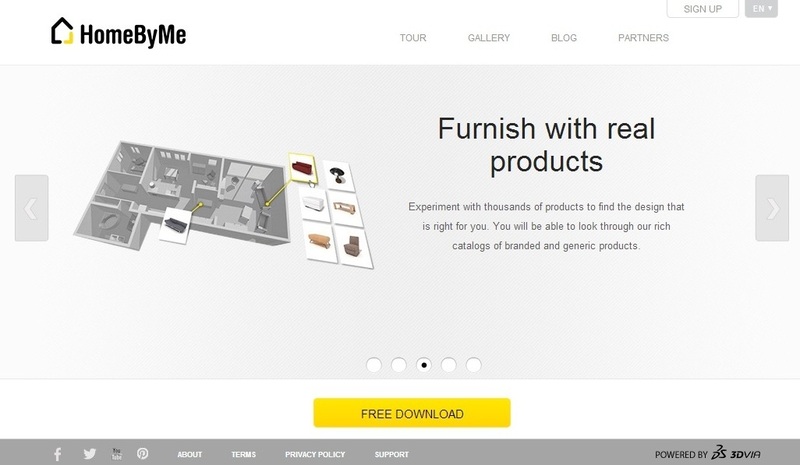 So - let's kick things off with a brief introduction of HomeByMe. First of all, this really is free. All the features are free. As far as I can tell they are getting their revenue from companies who are paying to have their product on the platform in the hope that if someone sees it and likes it enough to put it in their HomeByMe floor plan they might buy the product. 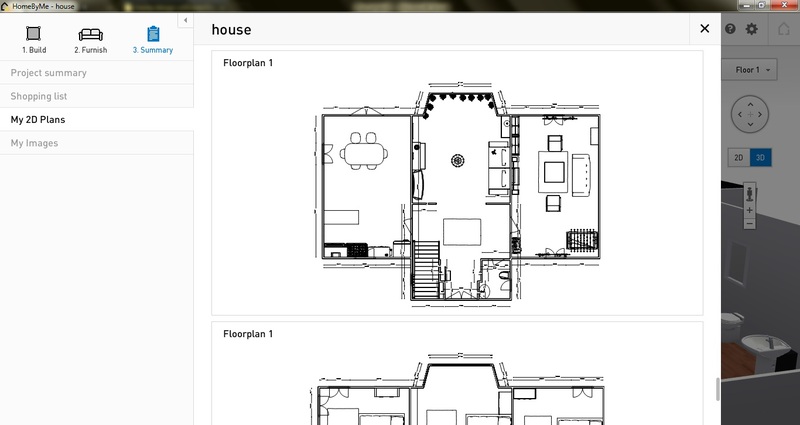 This HomeByMe review is part of the Free Floor Plan Software series. It's an app that you can download onto your PC or tablet. And in case you were wondering it's powered by ‘3DVIA’ whatever that is. When you arrive at the home page of the website you can go right ahead and click on the yellow download button and it's a question of following along with the download sequence (happily without distracting ads popping up all over the place). There's no need to create an account to download the software but as you'll see later on, it's a good idea to create one. Drawing the walls with HomeByMe is relatively easy. 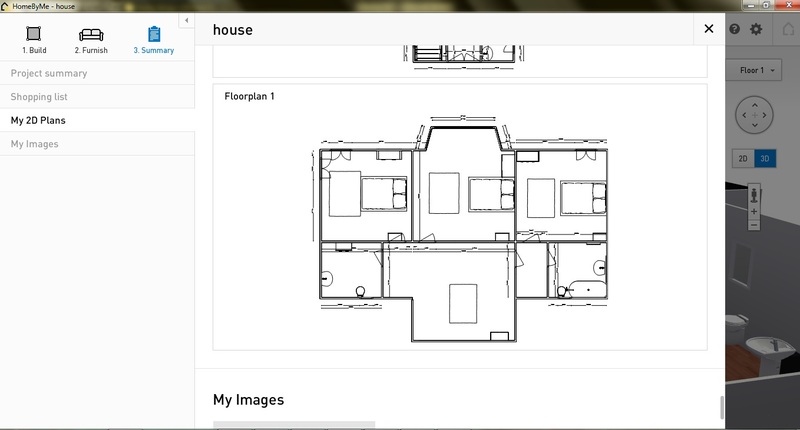 You just have to click the wall tab and select which type of wall you want to draw. As you draw the walls, the dimensions will be written next to them, and you just have to click the dimensions to enter a new value. Drawing a closed shape would result in the calculated area automatically showing up, saving you time from doing the calculation yourself. One drawback is that there is no option to make curved walls. You can only make polygonal shapes (ones with straight sides). To make a curve you will have to place multiple straight walls together at different angles. Putting in doors and windows is very simple, as again you just have to click on the respective tabs, drag and drop the door or window. You can change the direction of opening, height, width, and distance from the ground. There's no need to make openings for the windows and doors in the walls before dropping each of these on to the plan. Selecting the stairs tab, you can choose the type of stairs you want to put in. There isn't much choice of staircase shapes. The basics are covered but it you're looking for anything even vaguely impressive you're out of luck. When it comes to drawing the next floor to make things easier, the first floor can be easily cloned from the ground floor. Then you can add changes to the second floor where necessary. When you move on to furnishing the view switches in to 3D. Furniture is divided according to each room, such as bathroom, bedroom, living room and so on. This makes it easier as find what exactly you are looking for. Sofas, chairs and tables are available in a range of variety and colors. I love the fact I can make myself blonde if I like and my boys insisted on putting the football table in! 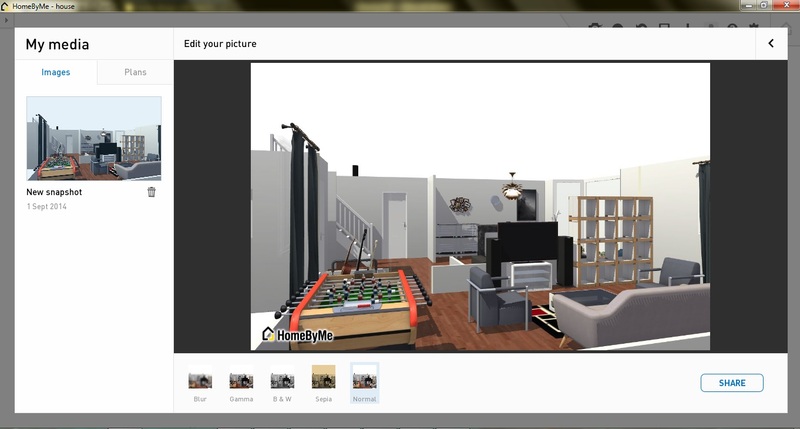 Home By Me automatically dismantles the front walls so that you can see inside. You can see from the screen shot below that I've turned the plan round - just to see if you could view it upside down - and you can. It's easy to view in 3D and the mouse scroll in, out, up, down, left and right is easy to operate. I had a look for a 3D walk through feature but didn't find one. Now saving isn't one of the things I was thinking about reviewing but I just want to call this out for HomeByMe. To save the project you need to sign in with Facebook, or through an email account. The projects are saved online, meaning you cannot save your projects offline. You could be drawing about for hour offline, only to find out your project cannot be saved offline - although you can share it. You can share your work easily to Facebook and Twitter, in fact every time you take a snap shot it asks you if you want to share. The alternative is to save your plan as a jpeg and share by email. 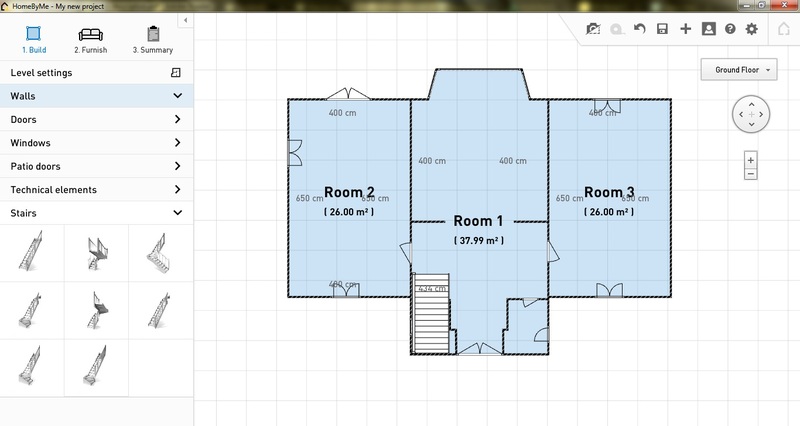 You can scan your floor plan drawing and import it to HomeByMe, scale it and change the default wall thickness in the software. 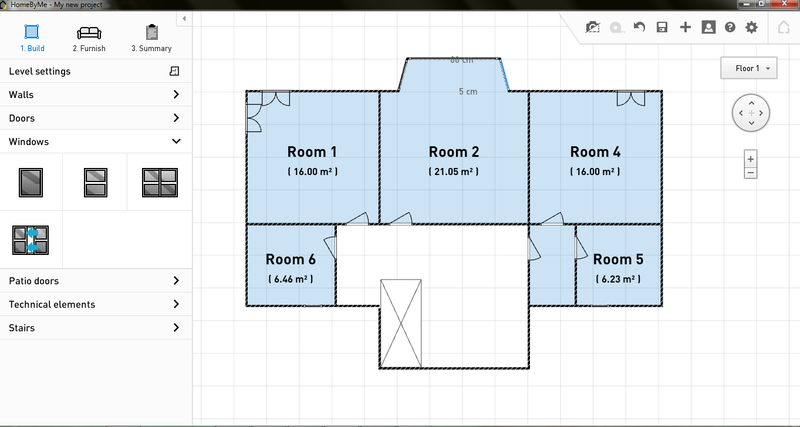 This makes your floor plan design accurate and to scale. 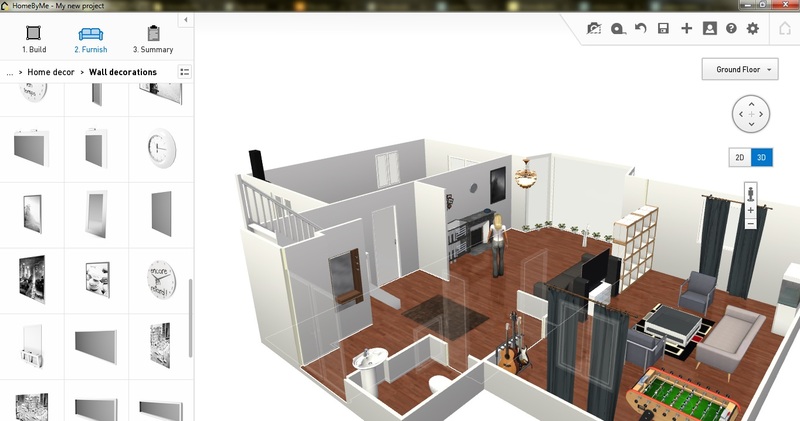 As I mentioned above, the furnishing is done in a 3D view. 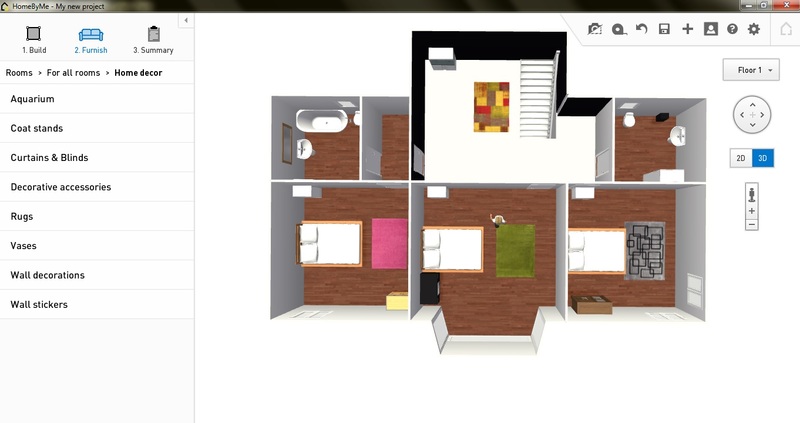 To get an accurate 2D floor plan view you can always click ‘summary’, and the software will produce a plan with all your furniture and appliances. If you want to use your design outside the software the file formats this software supports are jpeg, png, svg and dxf. Drawings can be printed on scale though, and sharing your renders is extremely easy since when you take a snapshot of your drawing it immediately asks you where you want to share this photo online, through Twitter, Facebook etc. To get help, you need to visit their website and click support. You can post your question in a public forum where you will get a response from the help team. Let's round things out with a bit of a recap. To end users it's free. I'm giving this a no because although the plans are saved online, the software is downloaded which means you need to download the software on all the devices you want to use to work on your plans. On any shape dimensions can be altered and so can the units. 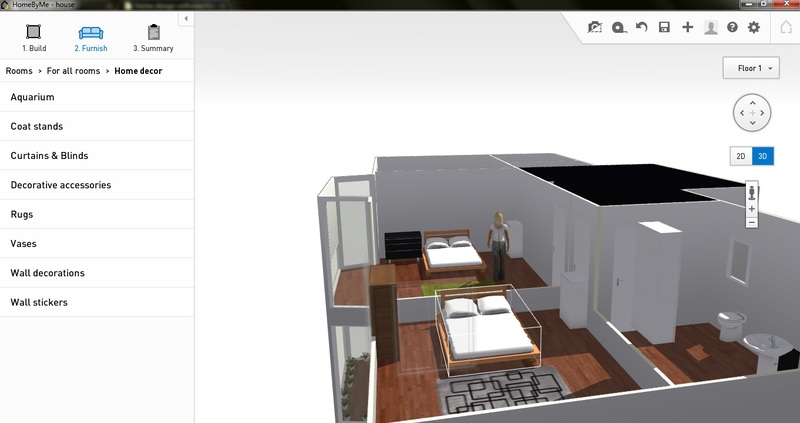 'Build' is in 2D and 'Furnish' is in 3D. No walk-through. Choose from a range of scales. The render images are saved in jpeg formats. There are buttons for sharing on Facebook and Twitter. Help is available on the website in the form of forums. What do you think of Home By Me? I'd love to hear about your experiences using this software.